Quirky in places, but still capable of building top-quality photo gallery websites. SmugMug is a specialist website building for creating custom photo and video websites. 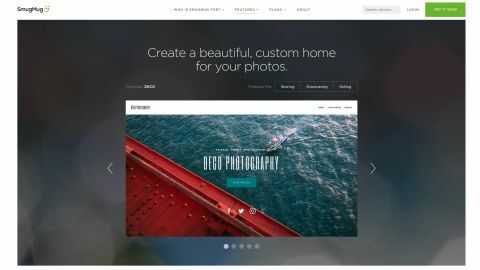 That sounds like a familiar idea, and many website builders claim they can do something similar, but SmugMug offers much, much more. Your website can host unlimited photos and videos, for instance, subject to a few size restrictions (150MB for photos, 3GB and 20 minutes for videos). A mobile app enables editing and archiving your content from anywhere, and your media can be freely embedded on other websites, including an option to publish directly to a Facebook album. No need to worry about the number of viewers you might get, either: there are no traffic limits. SmugMug can be used as a simple manager for your library. You're able to sort your media in various ways, add titles, captions and keyword, rotate photos, apply colour effects and more. You can also customise your site's look and feel, create virtual collections and smart galleries, share content via social media, even enable and moderate comments on your work. SmugMug's Basic plan supports media hosting and a very basic website, but there are plenty of limitations and you're only able to use a yourchoice.smugmug.com domain. It's yours for $5.99 (£4.28) a month, dropping to $3.99 (£2.85) on the annual plan. Sounds cheap, but if you've any interest in customising your site we'd give it a miss. SmugMug's Power plan enables using your own custom domain. It provides more than 20 website templates and can restrict access to folders, galleries, pages and the entire site to the people you choose. It's priced at $8.99 (£6.42) a month, or $5.99 (£4.28) if you subscribe for a full year, and would be our choice for a starter SmugMug user. The Portfolio plan gives you a complete web store where you can sell your content as custom greetings cards, photo gifts, digital image and video downloads, and more. It's $23.99 (£17.14) a month, or $14.99 (£10.71) paid annually - good value for an ecommerce package. The Business plan throws in a host of professional ecommerce and marketing features: customers can choose favourite images, there's support for custom coupons, custom branding for your shopping cart, branded thank-you cards in shipped orders, and more. There's a lot to like, but it's also notably more expensive at $41.99 (£29.99) a month, or $29.99 (£21.42) a month paid annually. If you're interested, good news - SmugMug allows potential customers to trial its service for 14 days, no credit card details required. Signing up with SmugMug is far simpler than we expected. No phone numbers, company names or physical addresses: just your name, email address and a password. It didn't even ask us to confirm our email address. A Getting Started page presented us with panels for the four main setup tasks: Start Adding Photos, Choose a [Website] Design, Get Organised, Start Selling. Other builders might force you to follow these tasks in a specific order, but SmugMug is far more flexible. If you're going to use the site essentially as a web library for your media, you can upload your pictures first. If the website is key, you might browse the templates. Choosing Get Organised enables setting up a folder structure before you upload, which could make sense if you know exactly what you need. It's really up to you. We selected the Design option and found only eight layouts. That's not as bad as it sounds: they're varied, look great and are all very customisable. You can preview each site in desktop and mobile views (not tablets) at a basic level, although some of the more advanced effects (lightbox, slideshow) didn't work for us. If you can't decide right now, it's safe to keep the default SmugMug template. It looks good, can be tweaked to suit your needs, and you're able to switch layouts later without losing your content. Whatever your design decision, importing your pictures is easy with SmugMug's feature-packed upload page. You can drag and drop photos from your local device; fetch them from your Dropbox or Amazon Drive account; import images from Flickr, sync with LightRoom, or upload directly from SmugMug's iOS and Android apps. Photos are imported to galleries, which are effectively website folders. You can nest these (Holidays/USA, Holidays/Greece), set their website visibility (anyone can see them, only visitors with the link, only visible to you), and password-protect anything sensitive. If your website needs are simple, there's little else to learn. Upload images, create galleries as required and they're immediately available for viewing on the website - you don't even have to hit a Publish button. A final Profile option enables personalising your site with your name, contact email, profile and cover photo and social media links. Fill in any of these boxes and SmugMug customises your site accordingly. For example, add your Facebook URL and SmugMug displays a Facebook icon on the site with that link. Put it all together and SmugMug offers a great way to get started. It's easy to use, you can produce a great-looking site at speed without having to jump through hoops, yet it's also packed with powerful functions and features. Open your website in SmugMug and you'll find a simple and straightforward interface, at least initially. Most of the window is taken up by an active copy of your website, which works as usual (you can click links, view images, add comments and so on), while a single toolbar at the top of the screen has options to upload and organise your images, customise the site or sell products. Having your website displayed in a clickable, active form is great for understanding how it will work, but not so convenient for editing. You can't click on a heading to change it, for instance, as is often the case with other services. Getting into real website editing starts when you choose a relevant option from the Customize menu. Sitewide changes include the ability to choose a new site template from one of 26 well-designed alternatives. Each of these can be further customised with a new theme, changing your website's colour scheme and background images. A 'Content and Design' feature opens the website in SmugMug's full content editor, where you'll get access to more low-level tweaks to change the website layout or add new functionality. The editor enables adding various content blocks to your site. These start with the basics: headers, text blocks, dividers, menus, images, videos and more. Discovery tools such as a search box and a keyword cloud make it easier for visitors to locate your photos, and there's also a map to display your geotagged imagery. A decent set of social media blocks range from simple links and icons to Share buttons, feeds and comments. There's little integration with external services apart from Google Calendar, AdSense and Google Translate, although you may be able to add others with blocks to insert custom HTML and CSS. Choose a block, drag it over the page and SmugMug shows you where it can be placed. Drop the block and it's automatically formatted to fit the space available. That normally works well, but if you need more control you may be able to resize the block or reposition it manually. Most blocks can be extensively customised by hovering your mouse cursor over them and hitting the Options button. Try this with a gallery, for instance, and you're able to change its layout, photo size and aspect ratio, spacing, caption position and alignment, paging style (scroll or click), sort order and more. The editor doesn't support right-click mouse actions or keyboard shortcuts beyond the usual plain text copy-and-paste. That's a pity - right-clicking an object to see the actions it supports can be a quick way to learn and use a builder - but using the editor in the regular way is easy enough. There is one significant problem here: SmugMug doesn't support Undo. You can usually avoid total disaster in the editor by ending the current action and discarding changes, but that's hardly convenient, and it won't help in all situations (you've accidentally deleted something important). If you're happy with a basic site and rarely use the editor, this might not matter very much. But if you're working on a major project and always making changes, it could become a real usability issue. SmugMug is all about presenting your photos and videos well, so it's no surprise that the editor offers plenty of tools to help. There are content blocks to display single or multiple photos, slideshows and carousels, as well as your own videos and clips from YouTube or Vimeo. Slideshows in particular are very tweakable. You can have them start automatically, present slides in a standard or random order, set a delay between slides, choose from 15 transition types, set a transition speed, decide which playback buttons to show (navigation arrows, play/ pause, fullscreen) and more. One of the more interesting options enables displaying multiple photos based on dynamic criteria, such as keywords, upload date and the number of views. This makes it easy to add a Recent Photos or Most Popular block to your front page, or to use the keyword search to display a group of photos on a particular topic. A solid range of editing tools allow defining photo titles, captions and keywords; applying watermarks and some simple colour effects; rotating and cropping your images, or assigning them a location (click a map or manually enter its latitude and longitude.) All of these actions can be applied to multiple images simultaneously for speedy batch processing. SmugMug requires Adobe Flash to play videos, too, a problem for visitors on iOS devices or anyone who has disabled Flash for security reasons. The website also supports a wide range of social features, from simple buttons to share links for content, to the ability for visitors to comment on your pictures or even upload content of their own. That's potentially a great way to engage your visitors and help to build a community, and a feature you won't usually see elsewhere. SmugMug has its video issues, then, but if you can live with those, or you're mostly interested in SmugMug's photo handling abilities, there's a lot to like here. SmugMug Portfolio and Business plans provide a fully hosted ecommerce solution which allows you to sell your photos and videos. Options range from charging for digital downloads, to enabling visitors to purchase one or more of your pictures as prints, cards, photo books, wall art, mugs, phone cases, mouse mats and assorted other photo gifts and products. There's no need to set up a storefront to make this work, as your content is already well presented in the existing galleries. All you get is an optional Buy button which allows customers to purchase everything in a gallery, or the specific photos they need. You also don't have to worry about payment providers, taxes, shipping or anything else. SmugMug's own professional shopping cart takes the order for whatever content and products the customer has selected, and ships the order from the US or the UK, depending on the customer's location and your preferences. For the most part, though, SmugMug's store features are very simple to set up and use. No need to take our word for it, either: the 14-day free trial gives you full access to SmugMug's high end Business plan, so you can try out all its more advanced features for yourself. Most website builders tuck their support section away in some distant area of the site, hoping you'll only visit occasionally, if you've run into a tricky problem you can't solve in any other way. SmugMug is, well, a little more enthusiastic. When we started our project, a welcome email arrived from a 'Client Success Manager' offering help and saying that "even if you don’t have any questions, hit reply and say hi. I’d love to hear from you about what kind of photography you’re shooting and how you found SmugMug." If you prefer a self-service approach to support, a web knowledgebase has some top-quality, detailed articles. Here's a Quick Start guide to SmugMug it's well-presented with appealing screenshots, nicely organised, not long enough to be intimidating but peppered with links to further articles where you can find out more. If you can't find an answer on the website, real support agents are available 24/7 via email. We posed a product question and seven minutes later received an excellent answer which covered all the angles, but still invited us to reply if we needed more. SmugMug may have its occasional quirks, then, but with the quality knowledgebase and speedy support it's likely you'll find a workaround for most issues with the minimum of hassle. The lack of Undo support is a problem, but if you're looking to share, present or sell your photos, SmugMug is one of the best services around. Give it a try.